Achill Coast Guard doesn’t think the pair would have survived the night otherwise. THE ACHILL ISLAND Coast Guard collaborated with Mayo Mountain Rescue and the gardaí last night to rescue two people who’d become lost on Croaghaun Mountain. A call was received at 7.30pm with reports of the two people lost, with conditions dark, windy, rainy and foggy. The coast guard said that it’s “probably the worst conditions to search in”. Due to the fog, a rescue helicopter from Sligo could not be used. The team only had sporadic phone contact with the pair “who really had no idea of their location at all”. 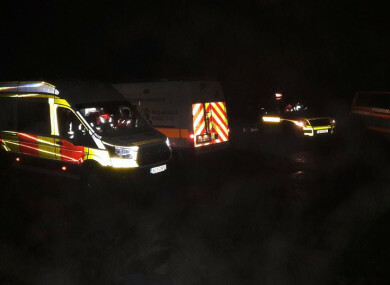 Eventually, it was established that the pair could see one of the rescue team’s vehicles at the foot of the Croaghaun Mountain at Acorrymore Lake. Three teams of rescuers were made and began to pick their way through rough, steep and boddy terrain. “Their mobile was nearly out of battery and we knew that they were very cold and wet,” Achill Coast Guard said. The two people were eventually found at midnight, four and a half hours after the operation began. They were led to safety and checked over by paramedics. All members of the team were home by 3am. Please stay safe, make sure that if you venturing out you are properly prepared and know where you are. The experienced people in the search believed that these two would not have survived the night if they had not been found. Email “Two people rescued after becoming lost in the foggy darkness of Achill Island last night”. Feedback on “Two people rescued after becoming lost in the foggy darkness of Achill Island last night”.